Dare I suggest these are the cutest gingerbread people you ever did see? 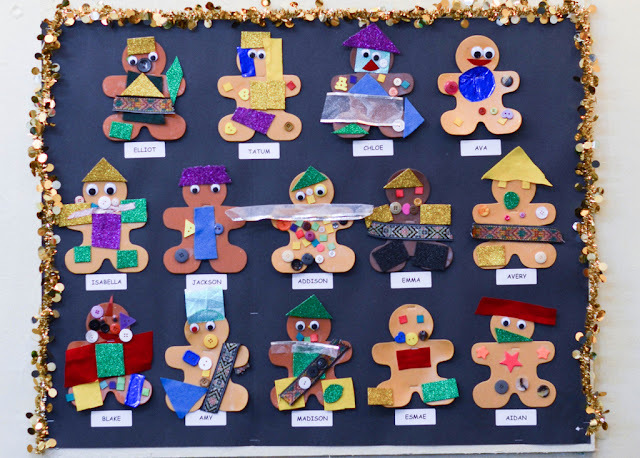 The kiddos glued felt, googly-eyes, wood chip squares, ribbon, printed fabric, sparkly sticky paper and buttons to bedazzle their gingerbread boys and girls. We also baked and decorated gingerbread cookies and performed a massive detective hunt to track down the "missing" gingerbread man who escaped from our tray in the oven (don't worry: he turned up the next morning and regaled us with tales of excitement and adventure during our circle time meeting). This is the version I read to my students every year. It's set in NYC!